MOVIE THEMED CANDLES. - CRUELTY-FREE BECKY. I picked up these candles off of Etsy and thought I'd let you know my thoughts on them. These are by the brand Old Glow Candles who are a little Leeds-based shop and online Etsy store who make TV show/film/book themed scented candles which are designed to smell like that of the world they are based on. So, for example, The Forbidden Forest candle is based on Harry Potter and is said to smell of 'golden woodlands and mist', or the Sherlock candle which smells of 'crackling log fire, antique wood and a hint of rain water'. Cool idea right?. They each retail for £10.99 plus £3.50 postage, so they aren't exactly budget friendly. However they are each handmade with natural soy wax, so it's understandable they have a bit of a price point - and on the scale of expensive candles, these are pretty reasonable. They come packaged in a sturdy glass jar with a gold twist lid. 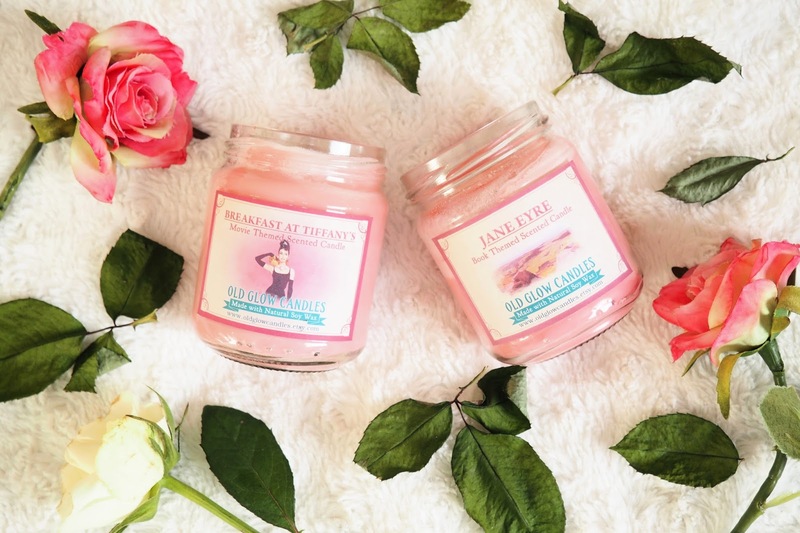 As soon as I saw the Jane Eyre and Breakfast at Tiffany's themed candles, I knew they would be the ones I'd end up buying. Firstly, they are both a beautiful pink (my fav). But also the description of the scents really sold me. Jane Eyre is 'winter woodland, English garden flowers and moorland grass'. A pretty dreamy image is conjured from that description, but in reality the candle just smells faintly of flowers. The story is the same with the sultry description for Breakfast at Tiffany's of 'luxurious milk chocolate and French perfume'. Similarly, it just smells faintly of a sweet-ish scent. It's safe to say I wasn't blown away by these. Overall, I really like the idea behind these, but I think they're a little bit gimmicky. They don't fill the room with scent and burn slightly weirdly. I think they'd make a nice present for someone, but wouldn't recommend otherwise. If you're interested in having a look at their range, here's the etsy site for Old Glow - www.etsy.com/uk/shop/OldGlowCandles. What are you favourite soy candles? I'd love to know! I know this is an old post, but if you are still looking for ethically made, vegan candles that are actually good, check out Belle and Book co! The scents are literally exactly as described! They don't have a single bad review on their etsy page :-) Personally I absolutely love them and will 100% recommend.